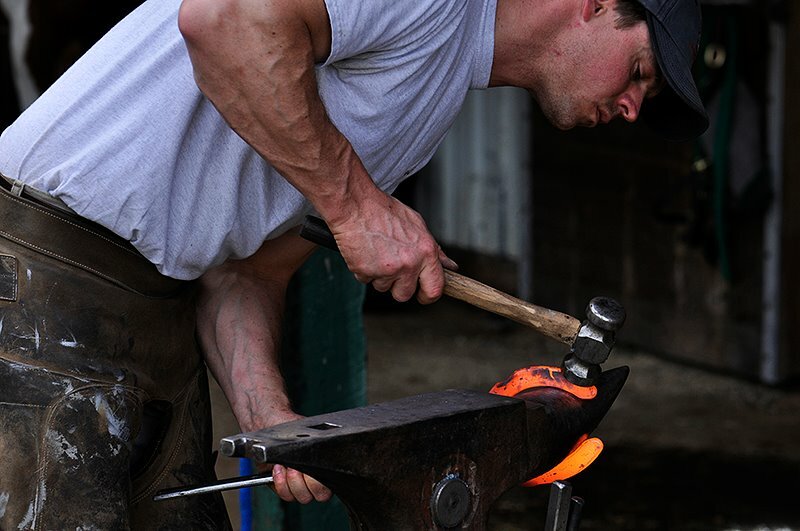 David Barron is an working farrier certified through the American Farriers Association and the American Association of Professional Farriers in the State of Washington, USA. David grew up on a large coffee farm in Zimbabwe, where he trained horses and competed in national polo and polocrosse. He started shoeing as a teenager, but took his first apprenticeship in Italy in 2001. He went on to attend the Damelin Equestrian Academy in South Africa. David has sought to shoe a wide variety of equine breeds and disciplines across the globe and continues to compete and attend numerous clinics. He has lectured at university veterinary departments on the equine digit and has given many clinics on farrier training and basic anatomy for horse owners. He currently manages Olympic Forge LLC in Western Washington. I have long come to terms with the fact that, despite the notions I harbored as a teenager and younger man, I may not be the world’s greatest farrier. I have some simple objectives when it comes to shoeing and, more often than not, I can meet those objectives and keep the horses that I shoe comfortable and happy. One accomplishment that I can hang my hat on is that I am an incredibly well travelled individual and a very well travelled farrier. To date, I have dealt with horses and farriers in eleven countries on five continents. My brother and I grew up playing national team polo and polocrosse in Zimbabwe, and learned to shoe- or rather, to nail a relatively flat piece of steel on a relatively flat hoof. As I look back on it now, I am always amazed at how few horses we watched hobble away once we were done carving on their hooves. A few things were acting in our favor though: we, like many polo players around the world, would pull the shoes off and turn our string out during the off- season, which typically runs through the short wet season of the year and is followed by a very dry spell. By the time those horses would come back in to the stable yard, their hooves would have gone through a soft patch and grown long in the grass, then dried out and broken off most all of their length on the harder ground. Typically when we’d line them up to be shod, there’d be some heel to level out, and a perfect outline of a hoof for a shoe to be shaped to. So we already had an idea of what a hoof looked like with all of the excessive length of it gone; the horses were ridden every day in a warm climate so they grew healthy hoof thereafter, and being that Zimbabwe has historically been known for it particularly pleasant climate we dealt with firm and healthy hooves for the entire length of the shoeing year. I am currently based in western Washington state, where in direct inverse proportions to Zimbabwe, we enjoy a beautiful Summer for a whopping two to three months out of the year. For the remaining months we are tucked away under a wet cloud with our horses and our anvils. It is a weather phenomenon that has been known to create a lot of depressed individuals, and a lot of balding farriers. We face a few unique issues with regard to horse’s hooves in the Pacific Northwest, and specifically on the western side of the Cascade Mountain Range. Unless a horse is kept locked up in a stall from sun up until sun down, there are no controls over the environmental impacts that taunt us with horses sliding in mud- pulling muscles, ligaments and tendons; hooves plunged into thick mud and ice where shoes are engulfed and lost forever. One further noteworthy issue lies in our isolated location. Hoof knowledge teeters upon the fictional anecdotes put forward by speculating veterinarians and horse owners are readily supported by a plethora of hammer- wielding enthusiasts hoping to secure a shoeing account. We could discuss at great length- an entire article of its own- the anecdotes of insanity I have heard since I started shoeing in Western Washington. Great degrees of distortion are evident in a lot of barns, and with it a lot of shearing bulbs and vulnerable areas for bacterial infection. Upon arriving in Washington, I had made the customary rounds, advertising my ‘great skills’ at the foot and anvil to every horse owner and barn in the area. I made great promises of what I could offer horses and felt confident that I could deliver. In terms of capsular dynamics, I am quite aware of what the general limitations and prospects for rebuilding and influencing incoming horn growth are and so it was not long before I had a full set of books and was able to offer people a level of customer service that most were unaware a farrier in our area could offer. That was Summer’s end, and gosh was I glad to be in the beautiful mountainous , picturesque and pine- strewn landscapes of Washington. Very shortly thereafter however, Fall and Winter moved in and I was quickly plunged into a a rapid upward learning curve as I realized that I had never, upon all of my travels, shod horses in a saturated environment and so a great proportion of my promises were suddenly coming up short. When all was said and done, a lot of the horses in my care were coming up unsound, or at least headed in that direction. That, I had never had to deal with. Of course, a lot of the problems were rider/owner- oriented, but I think we can all relate to just how well it goes over to tell a rider that yanking their horse’s face around to their belly whilst sticking a spur in their side just before plunging down a hillside probably is not conducive to keeping a set of shoes on. I truly believe that most lost shoes are the result of unbalanced riding as most of my lost shoes occur under the hands of bouncy backsides and unskilled legs and hands. Be that as it may, I also believe that it is of the utmost prerogative to keep horses in a farrier’s care hoof- happy. Once a hoof is put into a state where the demands upon it exceed the limitations of the capsule (as immediately happens to a hoof that required a shoe and has become shoe- less) it will fail, and that horse will eventually become lame. There is no controlling the rain, nor the mud that it creates. With the mud, an enormous amount of deriding occurs in the sole. Once that sole has failed, a lot of times the wall will start to fail. White lines start to disintegrate and the fabric of the wall shreds. Once the wall fails you’re really into it, as the only remaining weight bearing structure is the frog, and so the bulbs start to shear under the excessive force that it is being asked to support. So now you can’t drive a nail, your central sulcus is sheared and infected, and you’re stood in front of a client hoping to ride in their three day event- scratching your head and mumbling something about glue on shoes or easy boots. There are a few solutions, and upon arriving in Washington, I saw most of them being implemented by way of leaving thick walls- even grossly distorted sections of hoof to drive nails into “short” shoes. I can assure you, after a third phone call from a disgruntled owner in the space of a week, it is all too easy to start considering the same techniques. 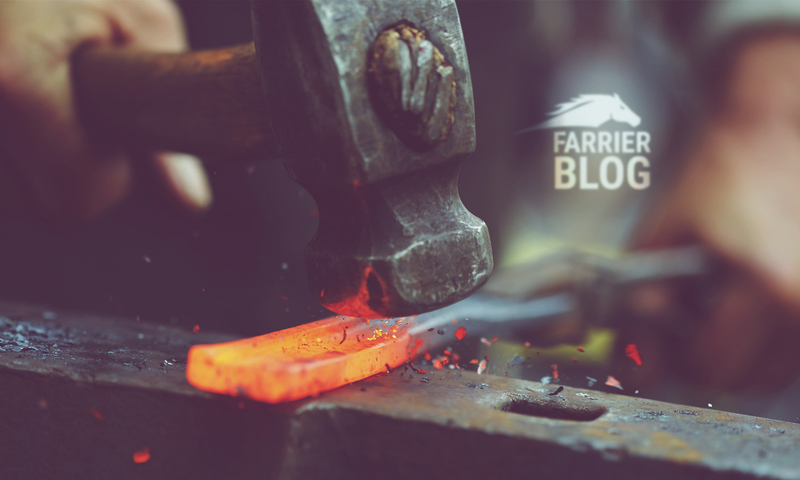 Having travelled a great deal means also that amongst working for various employers, I have also had to start various new farrier businesses around the world. Typically, no matter who you are or what you’ve accomplished, once you move to a new area, one starts with the bottom feeders and works one’s way up. Generally this group of horse owner has been using a low skill level farrier who has developed atrocious hooves either by way of using sub- par skill and misinterpreted knowledge; or else they’ve turned their back on the hooves as they’ve become preoccupied with other, “more important”, horses. So you inherit a grand number of horrible hooves to work with, which can work well in one’s favor once the distortion has been removed and a healthy, straight, strong and healthy capsule has been encouraged to replace the old, weak one. Once that’s been accomplished, hey presto, you’ve got a client talking up a storm about the great work you’ve done and your phone starts to ring. WHEN that happens. In a warm climate where the growth patterns are unhindered and predictable, a hoof can replace itself a lot faster. In a warm, dry climate, hooves are typically more rigid, and can sustain distortion reduction a lot easier than their pliable, soft brethren in damper parts of the world. Generally, people want instant gratification, even if they nod patiently as you explain the time constraints facing their particular hoof objectives. With that in mind, filing on a rigid, durable hoof in Nevada and removing every shred of dorsal or lateral flare all the way into the white line until you’re left with a perfectly shaped capsule that can grow down to the bearing border you’ve imposed and securing a shoe to a white line that’s more rigid than most walls we see in Winter Washington gives people what they want. A “Before” and “After” shot in about an hour. In a wet environment, this is not as easy to achieve. A sixteenth of an inch too much material removed can be the difference between returning in six weeks to a hoof well poised to continue successfully down the road to rehabilitation, or a hoof that has started to buckle and fail due to pliability being sandwiched between the weight of a horse and the supporting ground, and encased in fetlock- deep mud. Unfortunately another element of shoeing for uninformed owners and riders of lower- level skill ability is the uncomplimentary scenario: the horse that requires patten bar shoes, but has been turned out with a cycling, dominant mare in the mud- rink paddock; the horse recuperating from a solar resection and is trotted down the asphalt in his hospital plate shoes; the horse clearly suffering from poor stifles and hocks that just has to be halted at a slide- stop over fifteen feet every other day. Unfortunately, the mud can’t be helped. Believe me, there comes a time in May when I think everyone in Washington would like palm trees to sprout and SPF 150 to be mandatory. During Spring, we might experience three or four torrential downpours in a day, interspersed by intense sunshine. A hoof is a structure remarkably well designed to regulate moisture: it doesn’t take much sun to dry a hoof out, yet it is inescapable that given the amount of moisture we receive a hoof will bloat. Repeat this process four times a day, and you’ve put a lot of expansive stress on the hoof. If there happens to be a nail inserted in that hoof, think of what is happening to the clinch. It gets pushed up, the hoof recedes away from it; the hoof swells out to it again, and then recedes again. The nail head is exposed to the gravel and small nuclei that holds mud together, and before you know it, you have a shoe held on by two nails. So this hoof, as per the description earlier, is now exfoliated to the extent of soft palpation and sheared through the bulbs has too small of a shoe affixed to it with just two worn nails that are working loose against their rising clinches that are set into a thin and bulging hoof wall. Horse is walking along on this abomination of a digit, sinks into a particularly soft patch of mud, falters just long enough for a hind hoof to reach up and grab what’s left of this useless shoe and yank it off. Four days later, the owner decides to pick the hoof out and informs you that the shoe is gone. By this time, the bearing border is entirely broken up and there’s nothing much left to nail to. What to do? – Owner education. I am a huge believer in this, as in the United States we have no formal regulation. The only regulation that we do have is by way of consumer approval, and in order for that to be well enforced, the owner or rider must be informed of what is fact and what is fiction, what a healthy hoof should look like and how long it will take to achieve that objective. “Trust is not given, but earned” , is something that I used to hear repeatedly from my Master Farrier when I apprenticed. Once that trust has been earned, it becomes a very straight forward thing to tell a horse owner how best to manage hoof care by way of picking out hooves so that they don’t get scooped out, providing an area where hooves can dry, and considering options that best suit the environment that they are kept in or that best suit the discipline or level of riding. One very helpful aspect of this education is discussing length of shoeing cycle. Typically, during the Spring and Summer months we shoe on a five to six week cycle, and from Fall onward, everything goes to a seven week cycle. It does of course mean that for one cycle we are frantic, but considering the alternatives, it’s entirely worth the extra work. -shoes. We build about 90% of our own shoes on site out of concave stock, which we build out of the widest section that a hoof can accommodate in order to offer the most support possible to the wall. I punch the nail holes over a wide section of each branch so that the spacing spans from the toe quarter to the widest part of the hoof using six nails in most hooves. I drive my nails as high as I can safely, and in building shoes I find that I can pitch my nails up higher than I can ordinarily with a pre- fabricated shoe. We make our clinches small so as to reduce damage to the hoof should the shoe be pulled, and we seat them into the hoof so that we can file over the clinch as little as possible. I pull clips on everything from Spring to the start of Winter, and more importantly we seat them into the wall to maximize their effect and to minimize the damage done to the wall, again, should a shoe be pulled. Side clips are very popular in Washington, though we have pulled away from those shoes in option of quarter and toe clips. “Interfere as little as possible” is a maxim that I try to drum into my own apprentice, and where nails and clips are needed, I believe it becomes very applicable. Depending on where the horse is kept (stabled, or turned out), we box and safe our shoes to ensure that we have no excessive flat stock exposed, so the shoe fit must be hunter style in most cases. In cases where we have a full support shoe and have areas of heel left wide or full, a simple discussion with the owner regarding stabling usually becomes prudent and helpful to us and the horse. I forge or grind a cut into every heel to reduce the opportunity for a hind hoof to whack the fore shoe. I have had success with employing a rockered toe modification on the fore end of horses that are predisposed either conformationally or otherwise to pulling shoes off. -trim. I do believe in reducing hooves to proportions which lend themselves to the highest degree of tenacity with the internal structures, much as I used to find on our polo ponies at the start of the season in Zimbabwe. No leverage; no distortion. No distortion assists in a state of tendinous equilibrium as well as unhindered capsular function. Where there is unhindered capsular function there is open venal function, and hooves experience growth. Once the hoof is in a balanced state; that is, when a horse is inclined to utilize the entire bearing border of its hoof to distribute weight and hence utilize the concussion- absorbing properties of that hoof appropriately, the growth will be even and dense.Dense, healthy horn holds a shoe well. I like to leave as much thick sole as I can to support the development of sturdy wall, and to give it a chance to perform as a protective structure against the exfoliating and debriding mud that clogs up in a shoe and compresses against the internal structures. Our soils here play host to a wide variety of bacteria, and so any invasion must be addressed promptly by way of exposure, stabilization and topical management. I find that most threatening bacterial invasions target weak areas of the hoof: stressed heels, sheared frogs. Most horses that we have spent any time trimming or shoeing do not exhibit these tendencies. I hot fit just about every horse and I find that prepares a hostile environment for bacteria, and in cases where the capsule is failing as the result of excessive stress, I find that a well placed shoe (whether full or open heeled), will stabilize the capsule long enough for the area to be addressed by the owner. Any farrier anywhere can share their own anecdotal experiences of hardship in learning to best care for hooves in their particular area, These thoughts are my own and based upon the comparison of having shod in deserts, forests, warm and cold areas of the world. Summer is upon us now in Washington- the country is beautiful and the horses are happy. Whilst the challenges are numerous, I believe that it is the quality of a tradesman to refuse to compromise one’s work- short shoeing and producing distortion is not good, no matter which way you cut it- and for any farrier worth their salt to employ their skills at the foot and at the anvil to encourage healthy hooves to develop no matter where a farrier might find themselves. David that was a very interesting article. Working in a wet environment can cause a fair bit of grief at times as some of us know all to well. David’s been shoeing for us since he arrived in this area. We were so glad he came by to introduce himself, having been searching for several years– we have a sort of “puppy mill” farrier “school” here and as a result, this region is thick with seriously bad to moderately competent hoof care. The fact is that David’s shoes – even at the start when he was figuring out submarine farriery– stayed on better than anyone we’d worked with previously. David is well educated, he improves the feet of every horse he’s taken on slowly and organically, so that even our arthritic old school horses show in improving comfort and relaxation that the joints are feeling better. And he continues to study, continuously improving his practice. He’s good with the horses, they trust him. I can’t tell you what a relief it is as an owner and as a trainer with several other people’s horses under my care that he’s also an honest and clear businessman who provides an invoice for each client, is reachable in between visits, sends reminders out that he’s coming, and schedules the next visit before he leaves each time. His education for the client is SO welcome, too, I feel comfortable asking his advice on hoof care, and my clients love his clinics. Thanks again, David. You are so appreciated. Mary Anne, your words are so very kind. It is a pleasure to work with you and your horses as you well know.